Just about every stock segment I caught on Friday and over the weekend talked about the tech sector being very extended. The talk is of massive gains that reach bubble levels. The Nasdaq Composite hit 11 year highs so clearly it must be time to sell. Or is it? 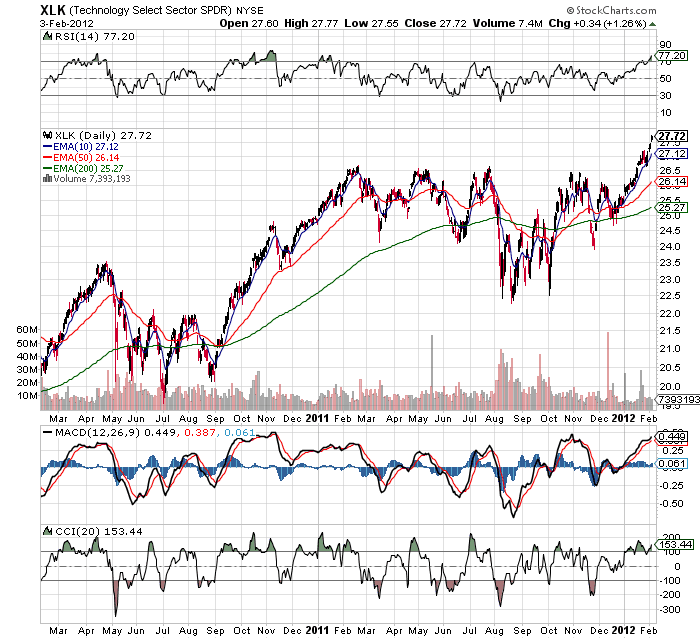 When finally taking a closer look at the Technology SPDR Select ETF (XLK), I'm actually dumfounded by all the pessimism. Sure the XLF has hit new highs. 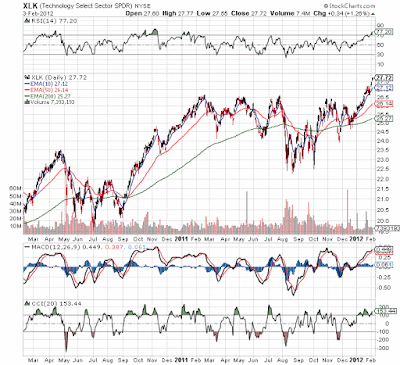 Sure the RSI and CCI are both showing an ETF that is overbought. Though I wonder about the accuracy of those measurements or the immediacy of the negative outcome. First, the index is only at $27.72 after first reaching over $26.50 back in mid February 2011 so over a year ago. Second, not more than 2 months ago the index was at $26.50 again. Third, the index hit similar overbought numbers in October 2010 and continued rallying the next couple of weeks prior to a shallow pull back and another 3 month run. Facing a similar run as Sept 2010 though Feb 2011 one would have to be nimble to catch any temporary pullback. One that will inevitably happen, but unless you correctly catch the top and bottom you'll just end up wasting trading fees. Honestly, the market is getting to that point that Stone Fox is looking at shorts such as the XLK to protect some downside risk. Unfortunately, it's difficult to imagine a market where an ETF that just broke through quadruple year long resistance as a shorting opportunity. More importantly, the tech stocks owned in our models such as Radware (RDWR) and Riverbed Tech (RVBD) aren't anywhere near 2 or 11 year highs. Some of the big tech stocks might need a breather, but the small to mid-cap plays remain in good shape. Disclosure: Long RDWR and RVBD. Please review the disclaimer page for more details.